Numark portable scratch turntable PT01 SCRATCH. PT01 Scratch is based on the record jacket size of the belt-drive turntable "PT01USB", equipped with Numark own scratch-switch is a compact scratch turntable to usher in a new DJ style. It’s a new era for DJs! With Numark’s PT01 Scratch portable turntable, you can scratch and cut?anywhere. Built with Numark’s exclusive Adjustable Scratch Switch?., PT01 Scratch enables you to grab your favorite scratch record (not included) and perform any turntablist scratch routine, whether you have access to AC wall power or you’re outdoors with your friends. 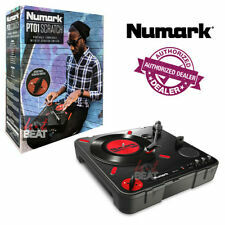 The Numark PT01 Scratch is a durable portable turntable designed for the turntablist on-the-go. The PT01 Scratch is a compact, AC- or battery-powered turntable, with an accurate belt-drive motor. The integrated scratch switch allows any turntablist to perform anywhere. The New Era of Scratch - It’s a new era for DJs! With the PT01 Scratch portable turntable, you can scratch and cut—anywhere. Built with Numark’s exclusive Adjustable Scratch Switch™, PT01 Scratch enables you to grab your favorite scratch record (not included) and perform any turntablist scratch routine, whether you have access to AC wall power or you’re outdoors with your friends. Stylus brush. © 2018 Perfect Circuit. If you experience a problem with a unit:do not attempt to open or repair the unit yourself. Speaker PT01 SCRATCH Dj Sound New F/S. 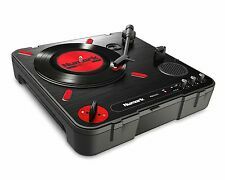 Numark Portable Scratch Turntable Built-in. Size: W302 x D302 x H102mm, Weight about 2.15kg. 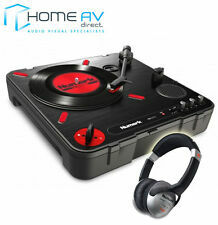 Numark Scratch Turntable With Built-In Speaker Batteries Corresponding Pt01 Scratch. Dominant Arm Capable Scratch Slide Switch Mounted. Our Products are 100% Authentic. PT01 Scratch. This item is Japan import. Middle East. Japan Usage Item. ※Germany, France, Italy, Mongolia, SriLanka, Turkey, Nigeria and more. Adjustable Switch For Right or Left Handed Scratch !!! 3-speed vinyl turntable (33 1/3, 45 and 78 RPM) with built-in Scratch Slide Switch. Built-in speaker, protective case, and integrated carrying handle. Note it will take 4 to 6 weeks from Japan. ・Weight: about 2.15kg. Flow of an order. Its a new era for DJs! With the Numark PT01 Scratch Portable Turntable, you can scratch and cutanywhere. Built with Numarks exclusive Adjustable Scratch Switch, the PT01 Scratch USB DJ turntable enables you to grab your favorite scratch record (not included) and perform any turntablist scratch routine, whether you have access to AC wall power or youre outdoors with your friends. Step Out of the Booth and Into the World It’s a new era for DJs! With Numark’s PT01 Scratch portable turntable, you can scratch and cut—anywhere. Built with Numark’s exclusive Adjustable Scratch Switch™, PT01 Scratch enables you to grab your favorite scratch record (not included) and perform any turntablist scratch routine, whether you have access to AC wall power or you’re outdoors with your friends.